Update your conference room with our custom alumimum power modules! With 3 power module sizes and 6 inserts available, you can design your own personalized power module to fit your exact needs! Our custom power modules feature clear anodized aluminum casings. One touch pop up design allows you to easily access plugs and ports. Customer is responsible for field install on exisiting office furniture. This power module would require an 8" x 4" cut-out. Power modules will be installed by the factory if ordered with many of our Custom Conference Tables, Custom Executive Desks or other any of piece of Custom Office Furniture. Custom Power Module w/2 Power outlets, 2 open ports sold above. Larger modules are sold below. 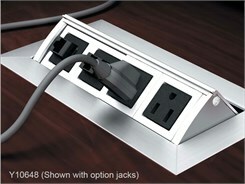 Includes 2, AC power outlets and 2 open ports, of which you can use any combination of our 6 inserts listed below. With flange, module measures 8-1/2"W x 4-1/2"D x 1-1/4"H when popped up. PRICE INCLUDES SHIPPING! Please allow 3-4 weeks for delivery.